In traditional installations, the engine must be very precisely aligned to the propeller shaft. The thrust of the propeller has to be absorbed by the engine and its mounts. These restrictions demand very stiff mounts which transmit high levels of vibration to the hull. The Aquadrive® anti-vibration system eliminates the need for stiff, hard mounts and for careful engine alignment to the propeller shaft. Instead, the propeller shaft is aligned to an Aquadrive® thrust bearing which absorbs all the propeller thrust and stabilizes the alignment. CV-joint shafts transmit engine power to the thrust-bearing and propeller shaft while allowing engine movements in every direction. Super-soft Aquadrive® engine-mounts isolate nearly all vibration from the hull and create the necessary conditions for a smooth and quiet boat. Aquadrive® systems utilize CV-shafts to allow extreme misalignment and engine movement. The system automatically adjusts to any changes in alignment between the engine and thrust bearing. Unlike standard marine engine installations, alignment is more easily accomplished and should not require periodic adjustments. Soft, flexible rubber elements are normally installed between the engine flywheel and gearbox to avoid torsional vibration. Aquadrive® CV-shafts can be directly coupled to those gearboxes without additional rubber or flexible elements. For flywheel-mounted installations, Aquadrive® torsional rubber dampers combined with CV-shafts (CVT-units) are available in a full range of power applications involving remote-mounted propulsion equipment, such as water-jets, stern drives and remote v-drives. In traditional installations, the alignment of propeller shaft to the engine has to be very precise and is subject to periodic maintenance. Relatively stiff mounts transmit high levels of vibration to the hull, even when perfectly aligned. The engine can be installed in a horizontal position using super soft and efficient mounts. Apart from easy installation and permanent alignment, this also leads to better space utilization while dramatically reducing vibration and noise. How much noise reduction by Aquadrive®? "As shown in our test results, it's obvious that the noise level on board became considerably lower after the Aquadrive® had been installed. Within the cabin, the noise level was in fact halved. It's now even pleasant to stay inside the cabin while cruising and, regarding the level of vibration, it was even possible to put down a cup full of coffee without having it splashed to and fro. The Aquadrive system solves a problem a century old; the fact that marine engines are installed on soft engine mounts and then attached almost rigidly to the propeller shaft. The very logic of the Aquadrive is inescapable. An engine that is vibrating on soft mounts needs total freedom of movement from its driveshaft if noise and vibration are not to be transmitted to the hull. The Aquadrive provides just this freedom of movement Add to this the fact that the Aquadrive allows the use of even softer engine mounts and prevents those mounts from pushing the boat along by removing propeller thrust, this eliminates the need for accurate engine alignment to be either achieved or maintained and even allows for deliberate angles between engine and shaft - an Aquadrive becomes a necessity. The drawing above shows a typical installation, be it on an 800hp pilot boat or a 1Ohp yacht auxiliary. The standard length systems come ready to couple to both the gearbox and the shaft and require only a new cross piece in the hull to which the thrust bearing is attached. In addition the constant velocity joints can have extension pieces between them of up to 2 meters in length leading to an even greater misalignment capability and even better engineering in vessels with particularly longer propellers. These extension pieces are made individually to each owner's requirements and offer a sophisticated solution to all manner of installation problems. Skilled engineers advise on solutions backed by years of practical experience. All Aquadrive's advantages apply when our shafts are being used. Without the thrust bearing component, to couple the engine to a jet drive or outdrive unit. A huge range of shafts, in standard or tailor made lengths, have made the Aquadrive an industry standard in power transmission. The Aquadrive CVT unit provides incredibly smooth transmission of power from an engine flywheel to a jet, or V drive. The sophisticated damper assembly is prepared ready to mount direct onto the flywheel with an Aquadrive shaft of variable length connecting this to the water jet or V drive Gear box. The damper assembly removes any rotational vibration from the combustion of each cylinder with the Aquadrive shaft removing the need for accurate alignment, allowing angles, and, and preventing the transmission of vibration. 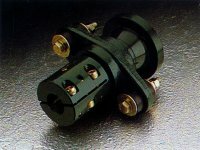 The unique properties of this drive shaft, with its free axial movement, allow the use of much softer mounts under the engine and the overall package leads to what one jet drive manufacturer described as the smoothest marine engine installation he had ever encountered. Engine mounts are a tiny part of a vessel but their importance is out of all proportion to their size! Get them right, with an Aquadrive and you have a smooth running installation which will last years. Choosing an engine mount is 30% calculation and 70% pure experience. Added to this, the product must have a diesel shield and it must have a positive steel captive mechanism in case of rubber failure. Aquadrive mounts are made specially for us and each of our four basic types come with up to five rubber stiffness variants. 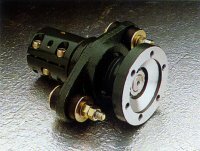 While many engine manufacturers use the same product, the Aquadrive coupling generally permits the use of a much softer rubber grade with a particular engine. Correctly chosen, our mounts and the Aquadrive coupling will give dramatically less vibration throughout the engines rev range. No more will you find a particular engine speed causing excessive vibration. You will have total smoothness from tickover to full power. © 2003-2007, Aquadrive All rights reserved.